* Now we know who’s been buying the Italian government debt … the Italian government! * ECB won’t have Italy’s back if Inflation remains elevated, but PPI today provides some relief. * Wall Street continues to raise earnings estimates. U.S. outlook remains strong. * U.S. Factory Orders fell in April, but improved on Y/Y basis. 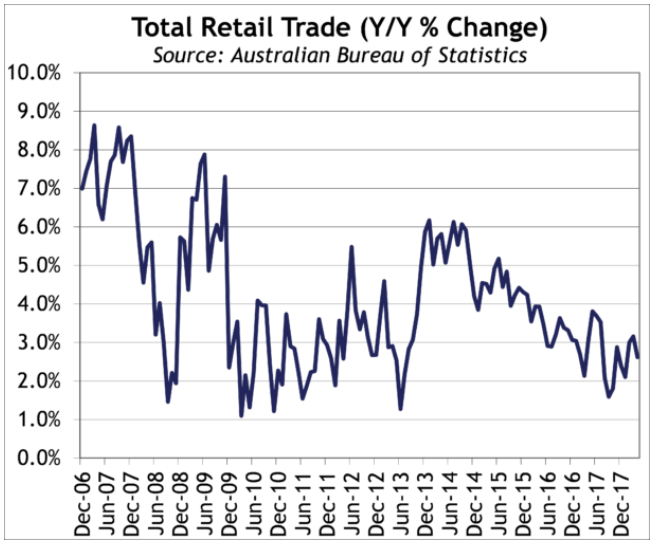 * Australian Retail Sales slow further … we are getting closer to declaring Aussie a problem. Who would have thought that the Italian government could manipulate the algorithms for its own benefit in a way that would make the fake news, some of the world’s largest hedge funds (no offense), and even Cambridge Analytica jealous? All we have to say is don’t get too comfortable that the Italian Treasury has your back. Italy bought back 2B Euros worth of debt, that’s 0.9% of the 223B Euros worth of debt it needs to refinance over the next twelve months. Clearly, Italy is going to need the ECB to do some of the heavy lifting from here and it still seems likely that the ECB’s QE program is coming to an end in roughly 3 months. This trickery can only last so long. Not to mention, Italy’s new government seems set on blowing up the budget. The new government wants to cut taxes via a flat tax that will cost the Treasury an additional 30B Euros (see here: https://is.gd/dAAUX7). And let’s not forget that the market was incredibly afraid when Paolo Savona was about to become Italy’s new Economic Minister. Yet, somehow the market seems to have completely missed the news that he’s actually STILL part of Italy’s new government (rather he’s now Italy’s Minister of EU Affairs … we’re not sure how that’s to be viewed as more ‘market friendly’). As for Italy’s other new appointees … well, some of them not only support Mr. Savona’s views, but they actually want Germany kicked out of the E.U. (yes, that was said over the weekend. But hey, Savona isn’t Economic Minister, so let’s all get bullish and buy Italian debt then? Hmm. See here: https://is.gd/3FKUO9). We wish you good luck buying those Italian bonds. At least you now know who the other buyer is when you need to sell in a hurry. Eurostat reported today that the Euro Area PPI was unchanged M/M in the month of April. This follows eight consecutive monthly increases. It should be noted that PPI slowed slightly to +2.0% Y/Y (versus +2.1% Y/Y prior). Note that Durable Goods prices increased +0.1% M/M, Capital Goods prices increased +0.1% M/M, and Intermediate Goods prices increased +0.2% M/M; however, Energy prices fell -0.4% M/M. Also, Eurozone PPI increased +0.1% M/M and +2.4% Y/Y (also +2.4% Y/Y prior). 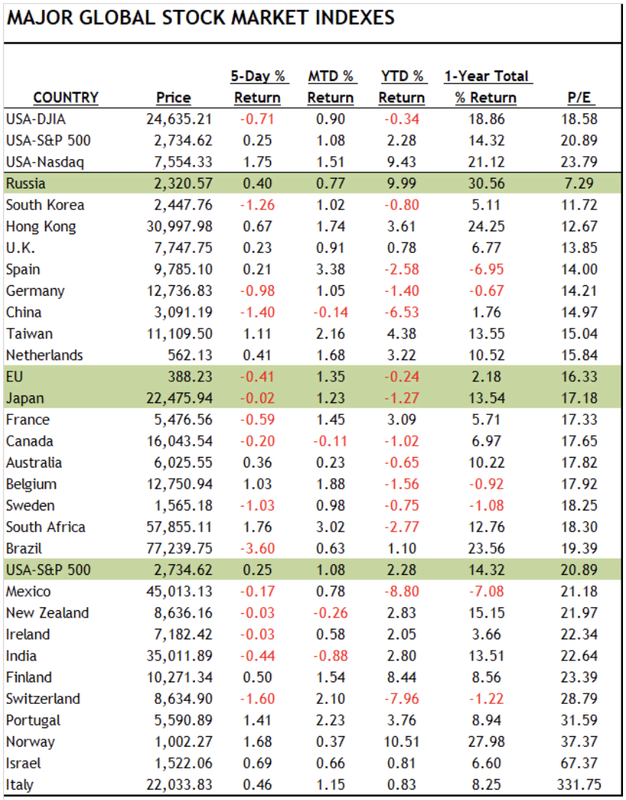 As of May 31st, 493 of the S&P 500 Index companies have reported Q1 earnings, of which 376 have beaten earnings (76.27%) and 88 have missed (17.85%) earnings estimates. Thus far, 62 out of 68 Tech companies have beaten their earnings estimates, while 49 out of 60 Health Care companies and 25 out of 31 Consumer Staples companies have beaten estimates. On the other hand, only 51.52% of Real Estate companies has beaten Q1 earnings estimates. Despite the earnings beats in Q1, Wall Street analysts have lowered their 2018 Q1 EPS estimates over the past two weeks by -$0.04/share to $36.37. However, the street increased their full year 2018 EPS estimates by +$0.21/share to $157.30 and their 2019 EPS estimates by +$0.44/share to $174.51. This implies EPS growth of +26.3% Y/Y and +10.9% Y/Y in 2018 and 2019, respectively. We are still below those lofty forecasts but we still see decent growth for 2018 and 2019. However, we must ask if lofty street estimates are both sustainable and realistic. We have concerns about rising employee costs, commodity inflationary pressures, rising borrowing costs, the effect of instant depreciation on earnings, as well as, some deterioration we are picking up internationally, as well as, in our GDP model. The Census Bureau reported that U.S. Factory Orders declined -$3.995 billion M/M to $494.45 billion in April. Thus, factory orders declined -0.80% M/M; however, orders are now up +9.37% Y/Y (+7.19% Y/Y prior). 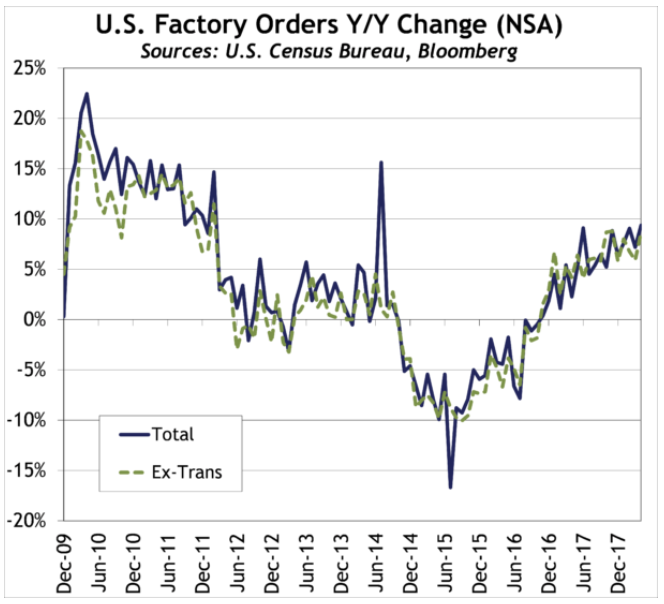 Factory orders ex-transportation increased for the 10th consecutive month (20 out of the past 21 months), up +0.38% M/M and +8.67% Y/Y to $407.28 billion (+5.90% Y/Y prior). Lastly, Nondurable Goods orders increased +0.06% M/M but Durable Goods orders declined -1.64% M/M. With home prices now negative, and household debt levels a mile high, we have Australian on our macro risk “yellow card” list. According to the Australian Bureau of Statistics, Australian Retail Sales increased +0.43% M/M(seasonally adjusted) in the month of April. This is the fourth consecutive monthly gain; however, retail sales slowed to +2.62% Y/Y (versus +3.16% Y/Y prior). In the month, Food store sales increased for the fifth consecutive month (+0.30% M/M), Restaurant sales rebounded +1.31% M/M, other Retailing sales increased +0.87% M/M, and Household Goods sales increased +0.69% M/M. However, Department Store sales fell -0.90% M/M and Clothing sales fell -0.83% M/M. U.S. Federal Reserve: We still believe two additional rate hikes will happen in 2018 and that the FOMC will become increasingly more data-dependent as the year progresses – but last week’s data increased the odds of 3 more hikes in 2018. The Fed simply isn’t “dovish” folks. 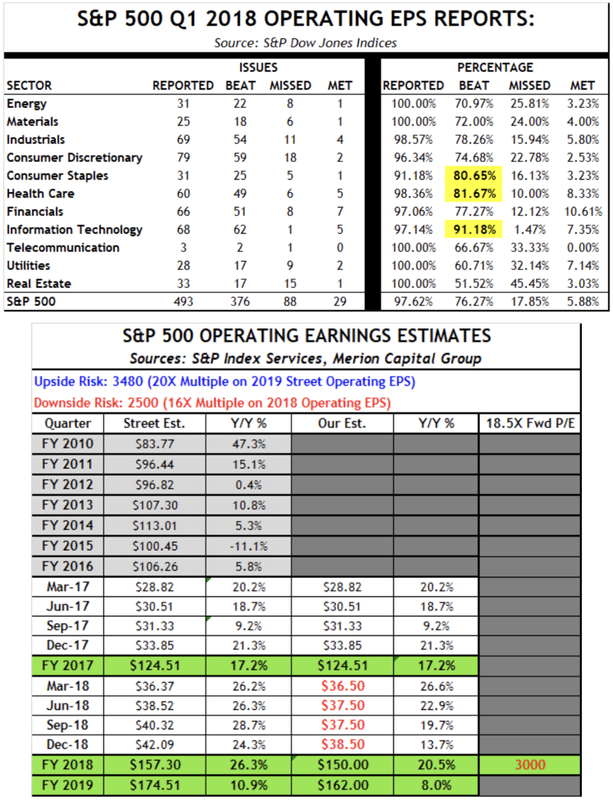 U.S. Equities and Earnings: S&P 500 operating earnings are rising materially, but the question remains, will the market put a 20 P/E multiple on forward earnings? We think a 20 forward multiple is aggressive, but 18.5 may not be. Our SPX target is for an 18.5x P/E on 2019 forward earnings of $162, bringing our 2018 SPX target to 3,000). We prefer financials given expectations for economic growth and our expectation for an improving (steepening) yield curve. Argentina: Argentina’s overall economic condition appears to still be on an improving track, as Industrial Production increased +3.4% Y/Y and Retail Sales accelerated to +35.6% Y/Y. However, Consumer Confidence slipped to 36.1 from 40.1, Exports slowed to +6.2% Y/Y, and Construction Activity slowed to +8.3% from +16.6%. Any signs of weakness are a problem when you are dealing with 7.2% unemployment and 26.5% inflation. Brazil: Unemployment continues to remain elevated (12.9% in April), which raises some concerns. However, the unemployment data is not seasonally adjusted and has been improving Y/Y. Also, Retail Sales accelerated to +6.5% Y/Y in March and Personal Loan Defaults improved in March (to 5.0% from 5.1%). Overall, Brazil’s data have been mixed in 2018, as PMI’s improve but Industrial Production slows. Of all the major global bond markets, Brazilian 10-year bond yields are the richest in the world at 11.42% which is attractive given that tax receipts are up +10.8% Y/Y (so long as the money is coming in, they can pay the coupon). As such, we remain bullish on Brazil 10-Year Sovereign Bonds. Canada: Canada’s housing market has deteriorated further, as existing home sales and prices have been weakening alongside building starts. However, Canada’s monthly GDP continues to increase (+0.3% M/M to +2.9% Y/Y), unemployment is still trending lower, Consumer Confidence remains at high levels, manufacturing PMI’s remain strong, and retail sales are elevated (+4.1% Y/Y in March). Mexico: Mexico’s GDP has been in a slowing trend since Q1 2017 (+3.3% then, now +1.3% Y/Y), Unemployment Rate increased to 3.4% in April, Industrial Production is now down -3.7% Y/Y, and PMI’s slowed in May, thus Mexico remains on our macro risk watch. The Mexican Central Bank has been increasing interest rates since late 2015 (mainly because of fear of dollar weakness). Meanwhile, Exports accelerated to +17.0% Y/Y, Consumer Confidence improved in April, and Retail Sales improved to +1.2% Y/Y. United Kingdom: The U.K. economy has been reasonably resilient throughout the BREXIT process (PMI’s mostly better in April) and therefore the Bank of England has been raising rates. But now inflation is slowing, Consumer Confidence has remained negative, Retail Sales have been weak, and home prices have begun to turn lower in London. Nonetheless, Unemployment continues to improve (4.2% in March) and Industrial Production accelerated to +2.9% Y/Y in March. European Union: The stronger Euro may now be a problem for Mario Draghi as CPI has been in a slowing trend for several months (and PPI may have topped out, as we discussed earlier). Not to mention, Industrial Production slowed to +2.9% Y/Y, Economic Sentiment is turning lower, and PMI’s have turned back from recent highs. We think the idea of an ECB hike within the next year is basically out the window, and as such we remain bullish on the Euro STOXX 50 Index, as well as European Financials. 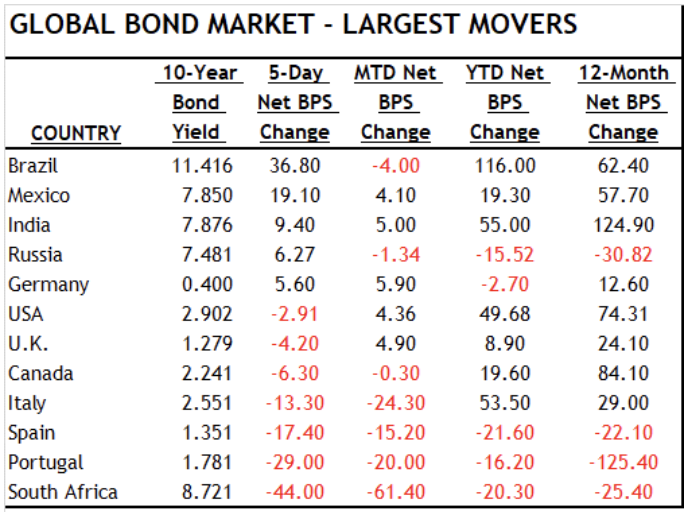 Turkey: What a mess … the currency is deteriorating, inflation is accelerating, PMI’s turned negative, and Erdogan is blaming everyone but himself. Australia: The RBA has cut rates twice in the past year and Australian data is mixed. So far, the Unemployment Rate appears to be ticking up slight (to +5.6% in April), the value and number of home loan approvals have turned negative, and Consumer Sentiment has ticked slightly lower recently. We remain neutral on Australia at this time, on concerns about China exposure but so far China is still posting strong data. China: With China cracking down on shadow banking, pollution, industrial overcapacity, and removing migrant workers from its cities, we expect China GDP to continue to trend lower and we are monitoring the situation closely. Overall, China data have been mixed. PMI’s continue to indicate solid growth, Industrial Production improved in April to +7.0% Y/Y (+6.0% prior), Industrial Profits accelerated to +15.0% in April, the jobless rate reportedly fell to +4.9% in April. However, Retail Sales slowed to +9.4% Y/Y in April (was +10.1%) and Home Prices are up +5.3% Y/Y (half the rate of change from a year ago). India: Indian economic activity appears to have recovered nicely since the new Goods and Services Tax (GST) was implemented as Commercial Credit accelerated to +12.6% Y/Y, Exports rebounded +5.2% Y/Y, inflation appears to moderated, and PMI’s improved slightly in April. However, Industrial Production slowed to +4.4% Y/Y in March. Indonesia: Indonesia’s GDP and Private Consumption Expenditures have been stable at 5% Y/Y, Consumer Confidence has been stable, Manufacturing PMI has been stable in the 49-51 range for a year, Retail Sales are up +3.4% Y/Y, and Exports are up +9.0%. However, Industrial Production is down -3.5% Y/Y. 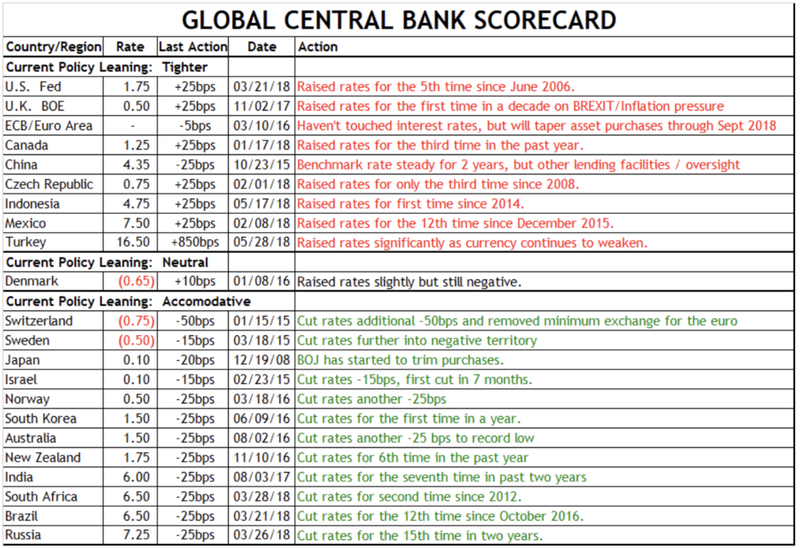 Also, the Bank of Indonesia raised rates for the first time in four years in response to the US FOMC rate hikes and subsequent stronger US Dollar. Japan: Overall, we remain bullish on Japan given that Japan’s economic activity remains in an improving trend:unemployment remains low (2.5% in March), Industrial Production is up +2.5% Y/Y, Retail Trade is up +1.6% Y/Y, PMI’s improved in April (but consumer confidence slipped), and Exports are up +4.6% Y/Y. Russia: The Russian economy isn’t setting the world afire, but GDP came in at +1.3% in Q1 2018. Overall, economic data continue to suggest economic growth, as Retail Sales were up +4.7% Y/Y in April, Real Wages are up +7.8% Y/Y, Unemployment is improving, Industrial Production is up +1.3% Y/Y, and exports are up +17.8% Y/Y despite sanctions. Meanwhile, Core CPI is muted at +1.9% Y/Y, which has allowed the Bank of Russia to remain accommodative. 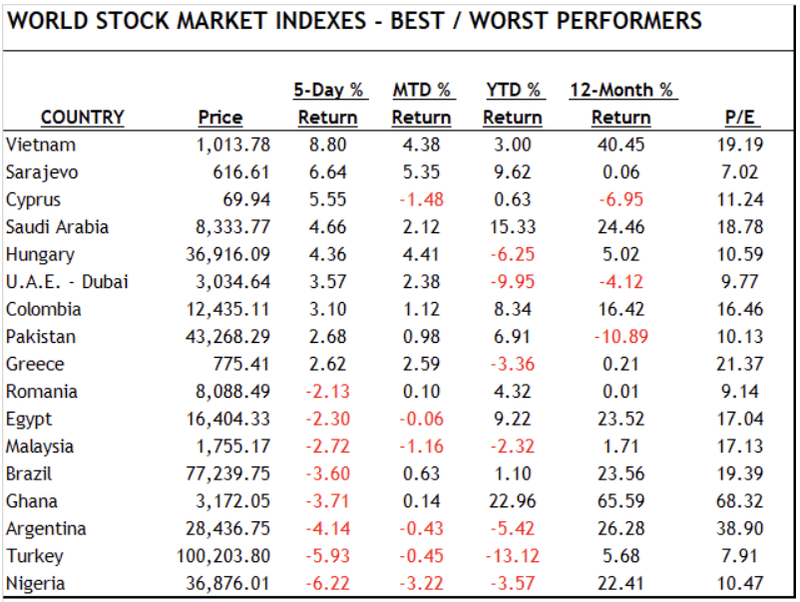 Russian equities remain among the cheapest in the industrialized world and we remain bullish. South Korea: While the world looks forward to peace on the Korean Peninsula, we are keeping an eye on trade data into China, which improved in March. Overall, SK is beginning to show signs of slowing post-Olympics (imports are slowing, Industrial Production is only up +0.9% Y/Y, Retail Sales slowed to +6.6% Y/Y, and the Nikkei South Korea PMI has been below ‘50’ for three months in a row).